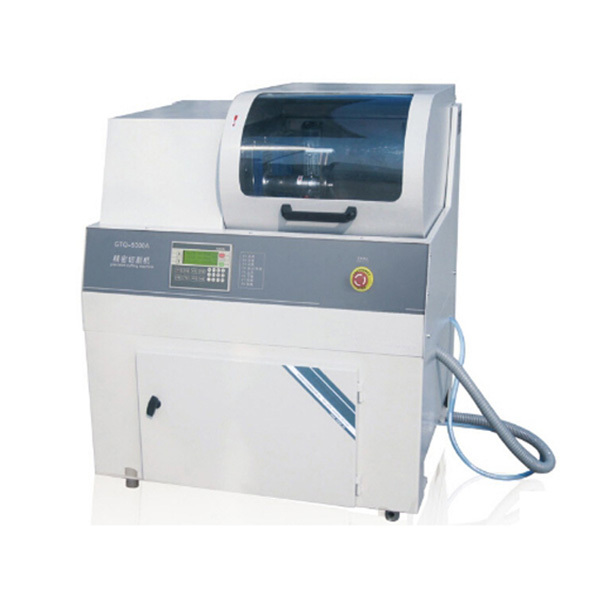 GTQ-5000A Enhanced Metallographic Specimen Precision Cutting Machine is suitable for metal, electronic components, crystal, hard alloy, rock, ore, concrete, organic material, biological material (tooth, bone) and other materials. The equipment sets high precision location and has large speed range. The cutting ability is strong and meanwhile the machine has strong cooling system. It can preset feeing speed and menu control with LCD. It is easy to control. Automatic cutting can reduce operator`s fatigue to ensure the consistency of the specimen. It has large and bright cutting chamber which is equipped with safety switch. The upper and lower distance of cutting disc can be adjusted, this is favourable for the cutting disc after a certain period of using. Therefore, it is an ideal equipment for the industrial and mining enterprises and the scientific research institutes. Looking for ideal Precision Cutting Machine Manufacturer & supplier ? We have a wide selection at great prices to help you get creative. All the Specimen Precision Cutting Machine are quality guaranteed. We are China Origin Factory of Metallographic Precision Cutting Machine. If you have any question, please feel free to contact us.